As advertised...no issues with product. These wipes are not flushable however we do offer these flushable wipes as an alternative. 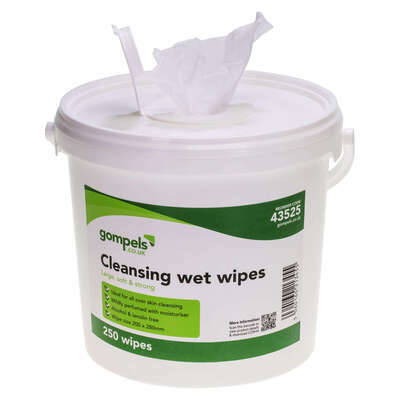 Our Gompels Moist Cleansing Wipes have been specially developed for use in patient caring environments and nurseries. Delivered in a large 250 pack size, the entire pack comes in a durable plastic bucket with dispenser hole on the lid and convenient handle for transportation. They have been designed to offer a super soft and strong service while locking in moisture and introducing added skin conditioners to eliminate the risk of irritation. Unlike traditional wipes, these moist cleansing wipes can be used all over the body, without the need for soap and water. A convenient and transportable option for patient cleansing as well as nappy changes, this economic pack size offers exceptional value for money and stands up strong against other leading brands. For the general cleansing of your patients, consider adding our Oasis Rinse Free Shower Cap or Nail Brush to your basket. In busy nurseries, our Baby Comfort station allows you to effectively and safely change numerous nappies a day without putting strain on your lower back or joints.